I just got my hands a wonderful new book; Bumble Bees of North America and I must say, I couldn’t be more impressed. This is a fine, paperback book of good quality and with many color photographs, charts, identification keys and maps. I have so much good to say about the field guide, let me get the two not-so-good things out of the way first. A few of the photographs seem a bit dark and out of focus. The latter is likely due to magnification, but with the new world of inexpensive, quality cameras, I’d have expected better from a bug book. Also, I’m older and find 10 pt type just too small for comfortable reading. That said, I absolutely love the book; it is full of wonderful facts like the fact that bumble bees are really just hairy wasps, that have evolved to become vegetarian rather than carnivore; they require pollen proteins rather than meat proteins. Who knew? The first part of the book includes information about attracting, decline & conservation, threats, maps and seasonal activity and a Forage Guide by Ecoregion which includes specific plants foraged by bumble bees in that region. More than half of the book is divided into four groups of specific anatomical differences. Apparently there is so much color variation within a specific species of bee; color cannot be used as an identification marker itself. Within each of the four groups, is a two-to-three-page species account of each bee in that group. Identification both by naked eye and microscope, photographs of both male and female and charts showing color variations found in the specific species. 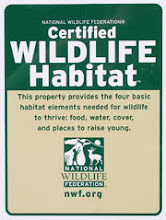 Maps, status, habitat, nesting behavior and seasonal occurrence are also given for each species. I find the list of sample foods preferred by each bee might help me with my ‘Pollinator Garden’. Just before the well organized glossary, full of macro-photographs and diagrams, is a thirty-page identification-key to female vs male bee. This part of the book is well over my head, and quite scientific. The book is clearly written for both for amateur and entomologist. All in all, I find the book perfectly helpful in my quest for information about these big ‘bumblers’. Who knew there are cuckoos in the bumble bee world, that are every bit as parasitic as any cuckoo in the bird world; taking over other’s nests so that other bees will feed and nurture their offspring for them?